Hello and welcome to another Stamp of the Month blog hop! This month we have over 50 hoppers sharing ideas for Illuminate, a set of 15 stamps sure to light up your life. If you've arrived here from Judy's Making Time for Memories blog, or if you're just starting out, you're in the right place. When you're done here, we'll head over to Haley's Inky Scrapper blog and see what she has to inspire us this month. If you get lost along the way, you can find the full list of hoppers here. I had a great idea for a scrapbook layout this month, but not enough time to find the pictures and pull it all together. So I wound up deciding to make a Christmas card, and I love the way it turned out! The papers and rosette are from the Sparkle & Shine Workshop on the Go. I used washi tape for both the blue houndstooth border and the three banners. I stamped the lantern and sentiment in black pigment ink and embossed it with black embossing powder. I added a candle stamped in Ruby, and candlelight stamped in Honey pigment ink and embossed with clear detail embossing powder. I'm afraid I'm a little out of practice making snow and I did this a little too quickly. To make it look nicer, you want to use Liquid Applique to draw on your snow design, sprinkle on some prisma glitter, and let it dry a few hours. (The dry time is what I forgot about!) Then heat emboss it and it will puff up and look like sparkly snow. I added a sprig of holly with Glitz glitter gel. The circles behind the rosette are from the Sparkle & Shine chipboard elements with bitty sparkles added. I also sponged the edges of all the papers with coordinating ink. And I thought the sentiment was perfect for Christmastime. I'll add another sentiment to the inside of the card. I hope you enjoyed my idea for you today. Be sure to let me know what you think, then head on over to Haley's blog to see her project. oooh...love the 'snow' on the lamp post! Clever! thanks Adeline! wish I would have remembered to let it dry a while first though! Love the detail on this card.....fantastic. Thanks so much! I know you gals will love everything as much as we do! This has a wonderfully Christmas in England feel to it--love the "snow"! Thank you for joining us at The Paper Players! Thanks Nance - loved this sketch! I know I'll be playing along more and more! I never would have thought of snow on the lanterns. What a pretty Christmas card. Love the colors and love the stamping. That snow is great! I like how the lantern turned out with embossing. Cute card! The use of adding snow to the lamp is a really nice touch. Thanks Connie - it's obvious that I haven't done it in a while, lol, but it's a technique I love! This is a very eye catching card. TFS! So cute, love the snow you added! Love love love the snow! What a great idea. 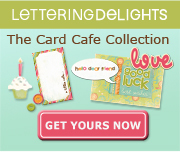 Even without the Liquid Applique, these cards would be gorgeous! This card is so sweet and filled with such pretty little details, Lori! I love that cool lamp, the rosette and your soft colors. Thanks for sharing your beautiful work with us at The Paper Players!